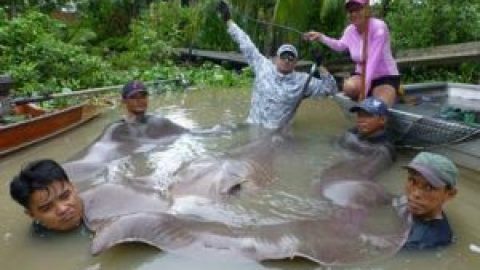 EU angler Jarno returned to Thailand on a short holiday and decided to try his hand at lure fishing at the highly prolific Pilot 111 fishing ponds near Bangkok. On arrival at pilot ponds Jarno was soon casting a light weight spinning outfit into the pond. With lots of Barramundi topping around the ponds it wasn’t long before the angler was bent into the first fish of the day which made a series of leaps out of the water before being brought to then bank. The Barramundi was weighed at a weight of 3kg and quickly released before the angler continued to cast at the showing fish. 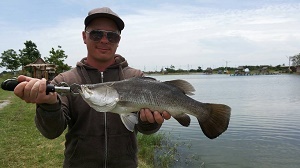 Several small Barramundi in the 2-3kg range soon followed which each aggressively hit the anglers Cultiva lure. After a short break for lunch the angler once again began fishing and landed several better sized fish to 4.5kg. Jarno then decided to turn his attention to the nearby pond which had been exclusively stocked with Asian Redtail Catfish. Changing to a bigger lure saw the angler soon getting amongst the larger framed catfish as he carefully bumped the lure across the bottom of the pond.